How about living here, in Lisbon? Those who live a location independent lifestyle have some 200 countries to pick from and different places within them. So where do the digital nomads go when they stop moving for a while? Some truly are nomads. They never stop in one place for long enough to settle in. That can get tiring after a while though, and make it tough to run a stable business. Eventually most people working remotely end up picking a base and renting an apartment for a while. Some end up investing in a home that we can rent out when we’re not there. Many entrepreneurs and lifestyle freelancers don’t feel a need to be in a community of a hundred or more people like them. They’re established and they have found their tribe online. For those who do want to be in a hotspot for location independent expats though, here are some of the top places where it’s easy to tap into an established scene. The big bonus is, prices in these locations are far lower than Canada, USA, Australia, and much of Western Europe. Chiang Mai gets the location independent crown, with an estimated 30,000 foreigners living there at any given time—most of them young and working, not retired or just passing through. Nicole Fu says, “In Montreal, I spent an average of CAD$3,256 per month.” In Chiang Mai, however, “I spent CAD$1,590.66 (48% of what I would spend at home).” If you poke around the web you can find plenty of blog posts outlining expenses of half that, so if you’re really on a strict budget while getting a business going you won’t be alone. “It was a great launching pad,” Nicole says. She was invigorated by being surrounded by other like-minded folks, hustling to live the same dream of location independence. There’s an educated, English-speaking, eager-to-work pool of youngsters here that many cite as an additional incentive. If you need to hire coders or assistants, you can meet with them regularly face to face. On paper, there are so many disadvantages of living in Bali that you would think nobody would bother. From tough visas to a difficulty in getting fast internet, there are plenty of reasons to pass it by. This Southeast Asia version of paradise draws in plenty of wanderers who stop wandering for a while though. Stuart McDonald of Travelfish.org calls the island home for his business and family . He has managed to work out a visa scheme where he only has to leave the country every six months. Ubud is the real center for the shorter stay crowd though, with co-working spaces and ample rentals available for reasonable prices. The overall cost of living is generally $1,500 or less even when eating out every day and drinking beer regularly. Marina and Andre run the Barcelona Eat Local food tour business and are long-time residents of the city. “Free WiFi spots are available everywhere in town, there are plenty of cool cafes with delicious treats where you can work, and a range of public libraries with plenty of facilities. English is spoken everywhere in contrast to the rest of the country, the cultural agenda is amazing (plenty of free concerts, top notch exhibitions and the city is an open air museum on itself). Moreover the authorities facilitate at large the development of businesses for expats.” They love the proximity to the beach and the mild weather. 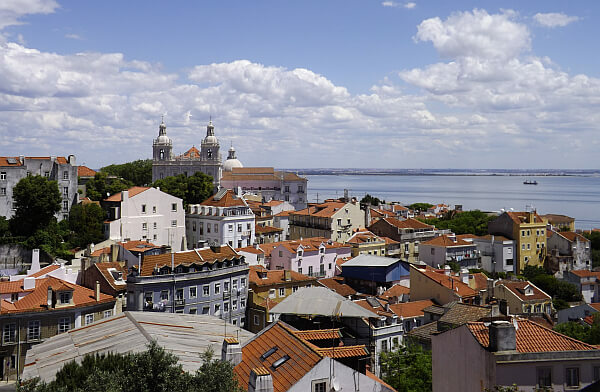 Portugal’s capital and its second-largest city attract the most location independent workers, though there are plenty more in the Algarve, in Cascais, and scattered around smaller towns. I recently interviewed Natalie Sisson after she bought a Portuguese house near Peniche, a small peninsula that’s a popular surfing spot. The interest rate on her mortgage is 1.95%. “The average full-time wage in the area is something like 600 euros a month, so you can imagine that makes labor costs to get work done quite reasonable,” she says. Once the darling of the expat scene in the pre-internet days, the city started emptying out its bohemian once prices tripled along with a corresponding rise in tourists. It’s still a good value though, with many easily getting by here for $1,750 a month or less. Just be prepared for some cold winters and super-crowded summers. It’s hard to stay here long-term anyway, so it’s a good three-month stop in the spring or fall. Long a magnet for the creative class, Berlin is the priciest place on this list but still manages to be cheap enough to attract location independent workers in droves. Those who go out a lot will not find Berlin to offer half-price living compared to other developed countries, but the rents are far cheaper than you’ll find in London, Paris, or Rome. Expect abundant and fast WiFi, lots of co-working spaces, and plenty of English speakers. For those involved with the arts or music, this is an epicenter where you’ll find plenty of like-minded souls. It’s hard to watch Narcos and not be amazed how far this city has come since its dark days a few decades ago. In many ways it’s the move vibrant and future-looking city in South America and its agreeable climate makes it popular with those who hate weather extremes. Check out Medellin Living for the dirt on everything from housing prices to the best nightlife spots, but know that you can live in the best part of the city for a fraction of what you’d spend in one of this size in the USA. On Numbeo’s scale where New York City is 100, Medellin’s rent prices currently score a 7.6. Like your friend with the addictive personality who has constant money problems, Buenos Aires never seems to get her act together—but she sure is a lot of fun. Argentina has gone through more booms and busts in the past century than most countries do in five, but B.A. remains most of the most interesting cities in the Americas and a hub for creative entrepreneurs. It’s hard to generalize about prices here since both the exchange rate and inflation have a big impact, but most expats seems to get by well on $2,000 a month or less. Utility bills and health care are especially cheap. You can get legal status here eventually, or just cross over to Chile or Uruguay every three months to renew. These locations are not on the radar in most of these discussions, but they’re showing signs of reaching a tipping point where it goes from a novelty to a scene. Marrakesh attracts the most tourists in Morocco and tends to get plenty of expats who settle down for a while. Others head to the less overrun city of Rabat. Max Robinson of WeSwap Euros says he knows at least 20 other digital nomads, but “there are hundreds of us living here based on chats that I’ve had on forums.” He spends around $250 a month on rent to be right in the center. He says the average in the area for a one-bedroom apartment is around $200. Old friends and family think he’s crazy but Morocco is a world away from Egypt and Tunisia in terms of security. Morocco is very Westernized in the sense that WiFi is readily available and the public transport systems are very reliable and safe, but it is actually a very cheap country to live in. For me, this was the perfect mix of elements that made it a country where I felt I could grow an online business. When I first started I could happily live off $10 per day in Morocco and I was making around $15 per day so I was living very well! I spend 6 months of each year living there and have never faced an issue running my business. As long as I have a good internet connection and a nice mint tea I’m happy! Despite a 180-day tourist visa and easy access from the USA and Canada, no spot in Mexico has emerged as a hub for location independent workers. One big obstacle has been slow internet speed: until recently 5 or 10 mbps was the best you could hope for. The telecom monopoly is finally rolling out fiber to the home, however, and Megacable is providing some much-needed competition. Keep an eye on San Cristobal de las Casas, Playa del Carmen, Puerto Escondido, the towns north of Puerto Vallarta, and Mexico City—the latter having the most working expats overall. There is some entrepreneurial action in San Miguel de Allende and the Lake Chapala region, but most residents in those places are retirees. It’s wired, has great air connections, and makes it easy to get residency. So far, however, Panama has been more of a banking and retirement magnet than a digital worker one. With a dollar currency and plenty of English-speaking workers to hire, however, this could change at any time. One of the best values in Europe on everything from apartment rentals to good wine, this centrally located European capital has attracted plenty of permanent expats and digital nomads. It’s easy to get around, to find fast internet, and meet other location independent expats making this their temporary home. Winters can be rough, however, and the right-lurching government hasn’t been very welcoming to outsiders who don’t already look like a hetero Hungarian. It has one of the fastest internet networks in the world, it’s cheap, and it’s relatively easy to get residency and set up a business as a foreigner in Romania. All it’ll take is a small community to start inviting their friends for some city to break out as the Prague of the 2020s. How about you? Have you found a great location with hundreds of other people working from their laptops? Put it in the comments below! Great and inspiring article! Just quit my job and looking to move and start my digital nomad dream very soon! Thanks again! the portugues housing market/ cost of living is barrelling upward, even in the 4 months i have been living here (timing!). my fave portugese design mag sub went from 25 to 75 IN 2 YEARS (a series of 6 at that). rising housing costs are a global issue and while portugal is no london the cheap rentals were hoovered up by wealthy ports for holiday rentals. a small somewhat decrepit place in the suburbs – 1 hour bus from centre – might be easier on pocketbook yet wont give you lifestyle. when you head north of cheap you head very north very fast – think 3 bedder for 2000+. porto bus transit is problematic – not to be relied on. for most part food prices are on par with netherlands/ germany – as are haircuts, massage physio etc. wages arent. “food prices are on par with netherlands/ germany” I don’t know what kind of parallel universe you’re living in Lily. I moved to Portugal from the Netherlands. We are paying less than half what we did before for groceries in the markets and about 1/3 for restaurant meals. Wine is less than 1/4. Maybe you’ve just been there too long or are looking at the wrong things. I’m not sure what a design magazine subscriptions has to do with the cost of living! I agree with Jan ( below ) — I lived 2 years outside Coimbra , in a small village in Serpins , on Aus$800/month. A meal out was €7. Food is nowhere near the same cost as Netherlands or Germany! I paid €50/month for my cottage , but an apartment in Coimbra is about €150/month. You forgot to mention how delightful the Portuguese are – – and how welcoming to estangeros. Barcelona is a great spot in Europe to start your location-independence business. The networking character around the city is just remarkable and some powerful circle conferences were held here. There are plenty of CoWorking spaces to join. Those are highly recommended as it makes it easy to connect to other location-independent entrepreneurs – like everywhere else in the world. Also, the laid-back character of the city itself helps to connect to fellow entrepreneurs in a more social, casual way; if that’s your business style. There are networking events like meet-ups, beach volleyball, and other sports events at or around the beach and the city itself. For European standards, Barcelona is an affordable city – if you stay away from the touristy downtown, obviously. You can find daily menus for 9,90€, and the rent of a nice, cosy room starts from 300€ a month while an own apartment starts usually from 600€. The grocery stores in Barcelona are slightly cheaper than in Germany, but this highly depends on the products you get. While food is generally speaking cheaper, hygiene products like lotions and sun cream are more expensive. Amazing what’s happening to the Mexican Peso. If that continues and internet speeds improve will have to consider it due to U.S. next door. Are there any good websites (not Airbnb) for looking for rental accommodation in these places? When I google them I get a lot of iffy looking sites. I’m just wondering how easy people have found it to look for accommodation, and whether they did so from home or on arrival. Thanks! Great article. Another great article! I’ve lived in a few of these cities-and I’m currently in Bali -specifically Ubud. The WIFI and Internet is still iffy…thus I’m heading back to BKK. I was just in Lviv, Ukraine earlier this summer and I feel it could easily be a hub for digital nomads. The rest of Ukraine was not so great- felt more Soviet but Lviv was very Western European. It actually reminded me a lot of Prague. Affordable housing (the average salary in Ukraine is $200-250), fast wifi, lots of great shops and restaurants and many of the younger people spoke English. My Airbnb in the center of the main square was $25/night. We had another apartment that was a bit outside the center (10 min walking)- 2 bed for $22/night. Craft beer at the trendiest beer place in town was .80 USD. A t-bone steak dinner was less than $9. It’s worth checking out for sure. The conflict there effect you at all? How close?